Earth is exiting a solar wind stream flowing fron the indicated coronal hole. Credit: NOAA GOES-13. The ring is about twice as wide as Earth and makes an easy target for backyard solar telescopes. It's worth watching. The magnetic field of this 'spot might be arranged in an unusual way, leading to instabilities and eruptions. Stay tuned. Photo details: Canon 300D, 200 ASA, 30s exp. "I took the picture by putting my camera on a garden table and pointing it straight up," says Bavais. "The streaks of light were almost directly overhead." Were they Leonids? Cosmic rays? UFOs? "None of the above," says atmospheric optics expert Les Cowley. 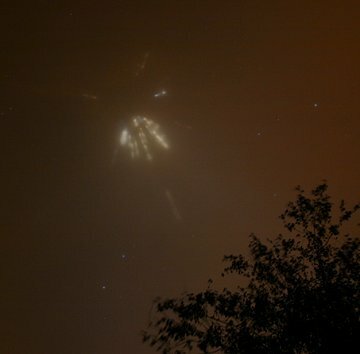 "These are urban light pillars." 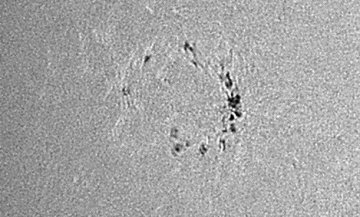 He explains: "That night above Ath there was an icy fog full of flat plate crystals. The tiny crystals mirrored the lights of the city beneath into sets of light pillars. The higher the crystals, the closer the reflection glints approached the zenith making the pillars appear to converge overhead: illustration. Why the breaks in the lines of light? There were several layers of ice crystals with gaps between them."